Who is Mandy? What’s your story? I am an illustrator and a retoucher. 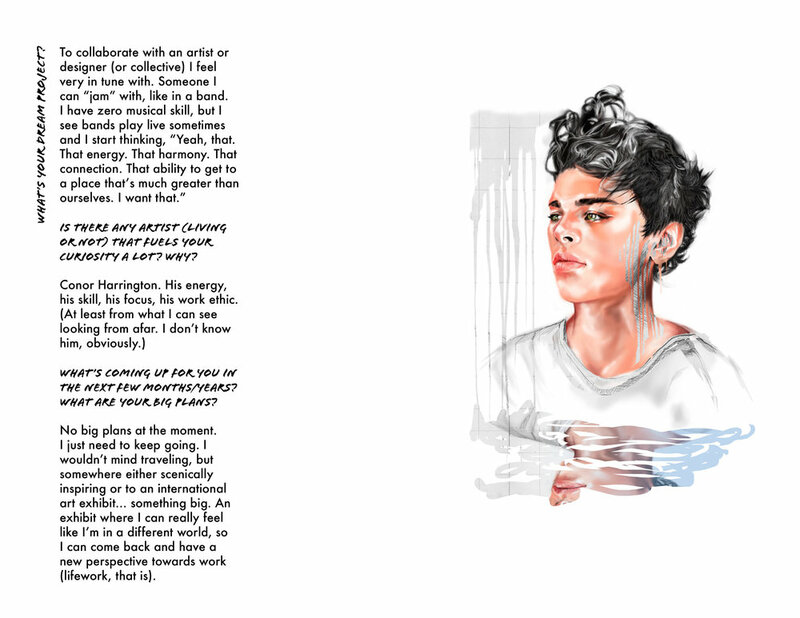 As an illustrator, my focus is on portraiture and fashion. As a retoucher, I retouch images for editorial and commercial projects for various industries (including, but no limited to, portraiture and fashion). I was a pretty shy kid who grew up in suburban Canada who liked drawing with pencil, liked watching Mr. Dressup draw cartoons (because it was like magic!) and liked playing with Print Shop on my dad’s PC – full on MS-DOS style. During grade school, I started to collect Vogue magazines and watched every single episode (that I could remember to record, anyways) of Fashion Television with Jeanne Beker and Fashion File with Tim Blanks. And then after some years, after some traveling, after some art exhibits, after some speaker events listening to entrepreneurs talk about choice and possibilities, here I am. I am an illustrator and a retoucher. I went to Toronto for university to study something unrelated to fashion and art, but I was surrounded by students who studied fashion, photography, new media, dance, theatre, etc. Being in different environments changes you for sure, I think. It was quite a shift for me to leave a small city for a place like Toronto. So many different scenes – different music scenes, different art scenes, different cultural scenes. If my friends and I wanted to find a party with a specific type of electronic music, we could find it. A lot of bands I wanted to see toured through Toronto, too. It was great. I felt very excited and very interested. For a few years, I was also training Capoeira (a Brazilian martial art). That was a whole other world for me. Learned a lot about the music – vocals, instruments, how to make instruments – culture, traditional dance, history, language, in addition to the martial art itself. After about 5 years in Toronto, I decided I just couldn’t call it home, for whatever reason at that time. I went back to Vancouver and continued working in advertising for a very short stint, then magazine publishing. I transitioned to a position in retouching, which I thought was the best position at the company, and just learned as much as I possibly could while I was there. While I was making a day-time salary, I enrolled myself in night school in a part-time Fashion Arts certificate program. I felt excited and interested again. Although I basically didn’t have a social life, I just worked and sewed and illustrated. I liked doing all of it, but looking back, I was definitely more into illustration. That’s more or less my story. If you can describe yourself / your art to us with any illustration which one would it be and why? I guess the self-portrait I did earlier this year? Is that too easy/too obvious of an answer? A little haphazard, experimental, not quite all ther- something like that. I officially started freelance illustration in 2009, after I finished a certificate program in fashion design. Before that, I just drew strictly on my own time for fun (basically since I was a toddler). How would you describe and characterize your art? My portrait illustrations are a mash up of pencil sketching and digital colouring. I like the course, rough, choppy pencil sketch look against a smoother, painterly application of colour. I sometimes add line and vector-like elements to it. 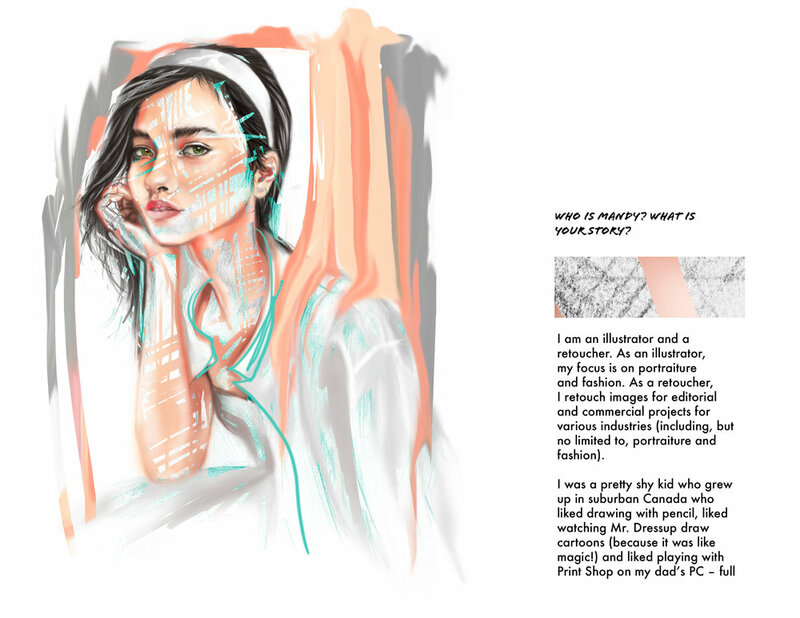 Most of my illustrations these days are inspired by fashion – fashion photography, fashion styling, fashion design. I am most interested when I see fashion art intersect with dark art – when it’s done well it can be quite captivating and interesting. I guess sometimes my style in my portraits can be a bit dark, too. Where and how did you get your artistic education from? Did you go to school to study art? I took some art classes in high school. I went to a tech university for my undergrad – so, not in art. After that, I completed the Fashion Arts certificate program at VCC here in Vancouver. It was there that I discovered a love for fashion illustration. Then, there were some YouTube tutorials and library books. I’m currently taking classes with an artist who teaches Classical Realism drawing and painting. I do want to make it a priority to improve my technical skills. Where do you draw your inspirations from? What inspires you? I guess just regular day to day human experiences. Life experiences and books I have been reading that talk about navigating through these life experiences, I suppose. I’m very interested in reading and learning about masters, too. Masters of the arts or any field, really. People with a high amount of intensive focus and dedication towards something they really believe in. Give us a glimpse inside your processes. How do you usually produce / create your art? I composite photos/portraits of different people in Photoshop. From that, I use it as my drawing reference. I sketch in pencil, then scan the pencil drawing into Photoshop from where I can apply the colour work digitally. Sometimes I play around with effects, but I don’t want to get into too many digital effects. Sometimes I get carried away, maybe. My fashion (croquis) illustrations are done using pencil, alcohol-based markers, and ink. I was working a live sketching event last year. This young boy saw that I was drawing and he came up to me and started watching me. I asked him if he drew, and although he said ‘No’ he proceeded to sit down and started drawing with me. He kept telling me he wasn’t good at drawing, and I asked him, ‘But do you like drawing?’. He kept saying he didn’t like drawing nor was any good at it, but he never looked up once from his drawing and just kept working away until he was done. I could only come to the conclusion that he was a bit conflicted – at such a young age, too – maybe due to the result of external disapproval and discouragement of the arts by parents or peers. This idea that even though he clearly liked to draw, it was just not worth pursuing. When he finished the drawing, he handed it to me and said it was a gift to me. He signed the drawing for me, too. (It was a drawing of a cat, because he asked if I had a cat and I said ‘Yes, his name is Logan’.) I told him that if he liked to draw, that he could pursue it. Not exactly sure how to describe the feeling that came over me, but I guess it was almost like going back to my younger self and wanting to stop time. I have no idea what this kid will actually pursue, but if I can at least convince even just one person in my lifetime to draw, then already I feel like this path has been worth it. I have his drawing pinned up in my studio. I see it every day. I have a lot of improving to do in terms of technique. If I can master (or at least improve) those basic foundation techniques, my ideas would flow much nicer. I have ideas, I just need to keep working on the tools so the ideas aren’t so held back by lack of technique. Do you have any favorites from your portfolio? It’s interesting because some of my favorite pieces are the least liked on Instagram. I think I’m very different from the people who follow me on social media. ‘And Here’ is one of my favorites. It could also be the moment I was in when I was creating it, too. I remember it being a lot of fun for me, for whatever reason, I don’t remember exactly. Now that I think of it, I might go back to that earlier question – maybe ‘And Here’ is more me than the self-portrait I did. What do you think is the proudest moment of your career so far? Can’t narrow it down to a specific singular moment, but I think my proudest moments are the moments when I’ve allowed myself to acknowledge that I’ve made it one step forward – as small as it may be. Cumulatively, it can be huge. It’s personal ­– not comparing. There are things constantly beating you down (well, it seems that way in my head, anyways). A lot of it is just overcoming your own BS and fears and insecurities. There are external factors too, of course, but those things are not in my control. So yeah, little by little, I’m learning more about myself, what is possible, and what is not in my control. Now, I just have the rest of my life to keep going. Is there any artist (living or not) that fuels your curiosity a lot? Why? No big plans at the moment. I just need to keep going. I wouldn’t mind traveling, but somewhere either scenically inspiring or to an international art exhibit… something big. An exhibit where I can really feel like I’m in a different world, so I can come back and have a new perspective towards work (lifework, that is). Definitely Sci-Fi. Hopefully a good one. A little odd considering I don’t read a lot of Sci-Fi. I have an idea for a Sci-Fi book based on an essay I wrote in Grade 10, but I can’t bloody find it (even though I have a tendency to hoard so much stuff. Have no idea how I lost that.) I still think about it to this day. It was written in the first person. That’s all I can say. Perhaps an organization that supports the arts and accessibility to the arts (classes, materials, art education) to local communities here who don’t have that accessibility. Something like that. I think something that supports not only art education but also ties in mental health education – so art accessibility, art therapy, and positive community.